Two gardens in one backyard. Beauty in details over two distinctly different gardens..
Why have one backyard garden when you can have two? 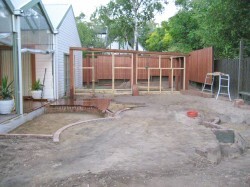 This question was the inspiration for the latest creation from Nick Pearson Landscape Design. His design creates two distinctly different gardens next to each other with a common flow, and some very creative ideas. Nicks designs include many small details which leave a finished result which can only be described as breathtaking. The first detail which is difficult to see unless you are directly above the garden can be found in the formal area. The design required a long central pond reminiscent of old English gardens, installed into an area which could not accommodate a long central pond. To solve this problem Nick used a little magic and tapered the whole garden away from the house to create the illusion of depth. The entire garden width at the back is smaller than at the front making the garden seem to be larger than it really is. 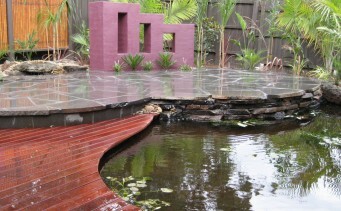 The second detail Nick concentrated on in this garden is the “floating” paver’s in the pond. 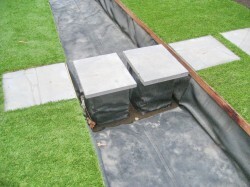 By having the liner extend up to the base of the paver, the reflective quality of Beutyliner can be used to hide the up stand onto which the paver’s are laid making them seem to float when the pond is filled. The finished resort garden is a wonderful blend or colour and texture, highlighted by a reflective pond separating the existing alfresco area and bird houses from the new raised entertaining area. Again you see the attention to detail in Nick’s design. A small pond and waterfall at the back of the paved area flows through a pipe under the pavers to flow out into the main pond near the edge of deck. This can be seen more easily if you click the image to enlarge it. Also of note is the way the edges of the paving stone blends seamlessly into the stone wall which disappears into the pond. 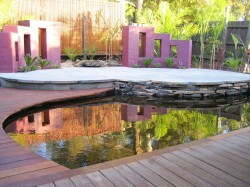 This garden is a great example of the reflective quality of Beutyliner pond liners, even when the pond is quite shallow. 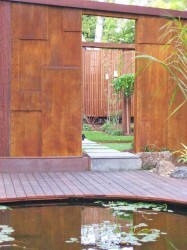 The last touch to this garden is an attention grabbing rusted steel dividing wall providing a juxtaposition to the two gardens. This wall is actually a stud wall, covered in marine grade ply and painted with a rust paint. As a whole, this garden is a pleasure to observe and as the plantings mature it will look even more stunning. 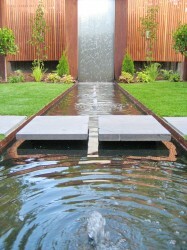 Nick Pearson is an innovative and detail oriented landscape designer and artist. After many years as landscape designer and builder, Nick has decided to hang up his shovel and concentrate on designing gardens with a difference. If you would like to contact Nick, send us your contact details and a brief summary of your requirements and we will pass them on.